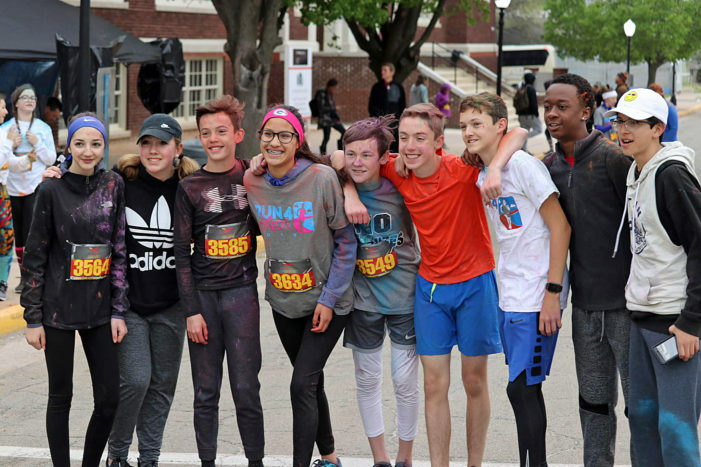 Despite near freezing temperatures and rain showers, the third annual Color Run in honor of Lexi Hastings went on with excitement. Runners and walkers of all ages took part in the RUN4LEXI with a 5K run, walk or jog and a one mile fun run starting in front of Guthrie Junior High. Of course, before anyone took off, everyone was doused with a different colored powder. “Rather than sell goods, we want to engage the entire student body and community in a fitness initiative that aims to encourage a life-long healthy way of living,” Junior High teacher Tina Ogle said. The run helps honor Hastings who passed away suddenly in 2017. The 19-year-old was a graduate from Guthrie High School and earned a cross country scholarship at Northwestern State University. All proceeds went to the LEARN2LOVE program. LEARN2LOVE is a program started at the Junior High in the memory of two school teachers, Jennifer Briggs and Heather Wilson, who were tragically killed in a vehicle accident while commuting to school in 2014. “We started (the program) to help students in any way that we can, whether it be classroom supplies, shoes, clothes, coats, or anything else that may meet a student’s needs,” GJHS Principal Robbie Rainwater said.